The Late Bronze Age (approximately the second half of the second millenium B.C.) was the time of the great Pharoahs Thutmose III, Ahkenaten and Ramses the Great and their enemies the Mittani, Lybians and mysterious Hittites. It was also the era of the wars that are immortalised in the tales of Homer about Achilles, Agamemnon and Helen of Troy. The principle weapon of war was the chariot, pulled by speedy ponies and bearing a warrior armoured in bronze and firing a sophisticated bow at his enemies. 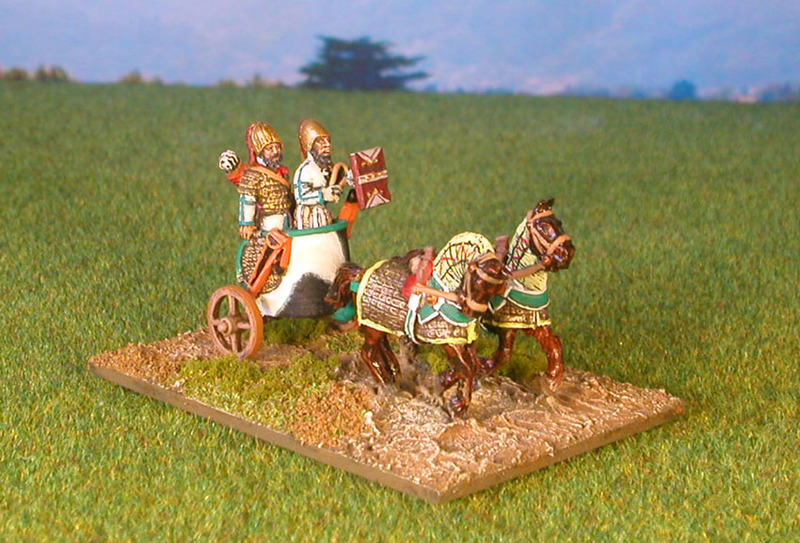 Levied Syrian spearmen make up one of the contingents of the army summoned by the Hittite Great King.These are all Ral Partha figures that used to be produced under license inthe UK by Minifigs. Not sure if the moulds transferred over when the Minifigs range was bought by Caliver. Lovely little miniatures that mix very well with the Foundry range. Not many variants in pose but the choice of shields keeps them from looking too uniform. The standards are a bi-product of patient hours spent in sewing and bead shops with my wife. Specialists such as these bowmen might be levies or hired mercenaries. Redoubt figures from their Trojan range. Characterful sculpts although some of them have a face only their mother could love! The Society of Ancients' Battle Day 2011 was Kadesh.